This post brought to you by Fresh From Florida. All opinions are 100% mine. You're probably expecting another seasonal recipe today. Maybe some pumpkin, or something covered in red and green sprinkles. But while most of America thinks of turkeys and presents when they think of seasonal, living in South Florida can give that term a whole new meaning. Living where I do comes with lots of perks but one that I often take for granted is that while much of the country is dealing with snow and ice, we can be enjoying fresh local seafood anytime we want. Being someone who fishes himself, Justin is pretty picky about what kind of fish is served to him in restaurants. That is why if he didn't catch it himself, he likes to buy our fish at local fish markets that feature seafood fresh from Florida. He specially looks for the Fresh From Florida seal so that there can be no question about where our seafood came from. 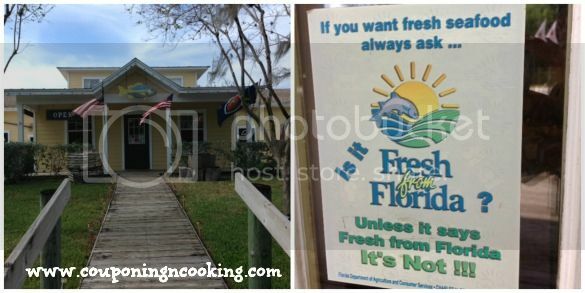 Once we got our grouper home, the Fresh from Florida website had tons of recipes and ideas for ways to prepare our fish using wholesome ingredients to create a restaurant worthy dish at home. 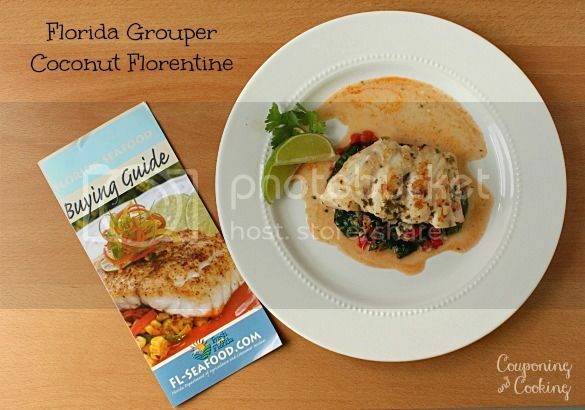 This Coconut Florentine Grouper was the perfect Floridian dish exactly like something you would find on the menu at your favorite waterfront tiki bar. 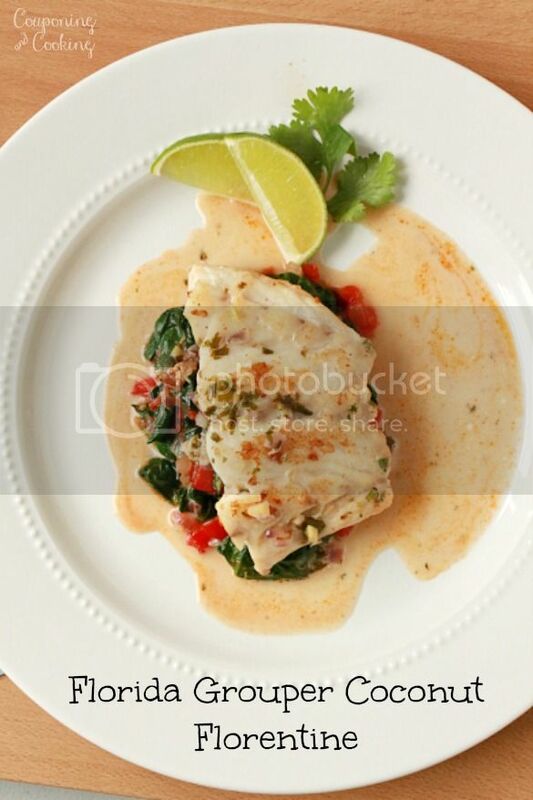 Grouper cooks pretty quickly so make sure you have all your prep work done before you get started with the recipe. Be sure to visit Fresh from Florida's website for more seasonal seafood recipes! 1.) In large saute pan over medium-high heat, saute fillets in 1 tablespoon olive oil 2-3 minutes per side until browned. Remove fillets and set aside. 2.) Add garlic, ginger and 1/4 cup onion to pan; cook until tender. 3.) Add coconut milk, lime juice, cilantro, soy sauce, and hot pepper sauce. Bring to a boil and add fillets; simmer 1 minute until fillets are opaque in center. 4.) In a separate large saute pan, heat remaining 1 tablespoon of olive oil over medium-high heat. Saute remaining 1/4 cup onion, tomatoes, bell peppers and spinach until greens are just wilted. 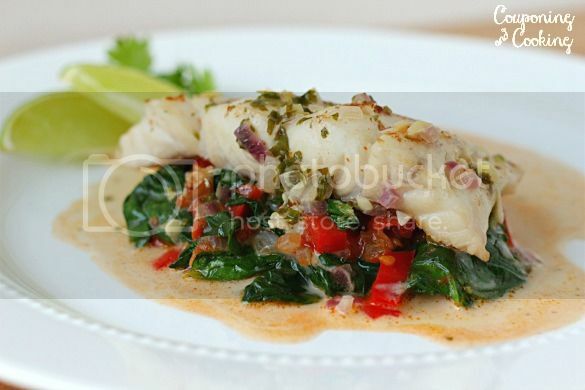 Serve fillets on a bed of spinach mixture. And top with remaining sauce. I loved this recipe, it's so versatile. I updated it with what I had on hand. Made the fish how it was written except used coconut aminos instead of soy sauce to make it gluten free and whole 30. For the veggies I used swiss chard, potatoes, onions and about 1/4 cup of tomato sauce.